Typically, I hate cucumber beers. I’m more of a pickle guy. But it just works in this saison from Sweetwater, which is just funky enough to keep this easy-drinking, light-bodied beer interesting. Here’s your craft alternative to Big Beer lagers. It comes in below 5% ABV and falls into the Bohemian-style lager territory with a slightly sweet malt bill and crisp, bitter hops. 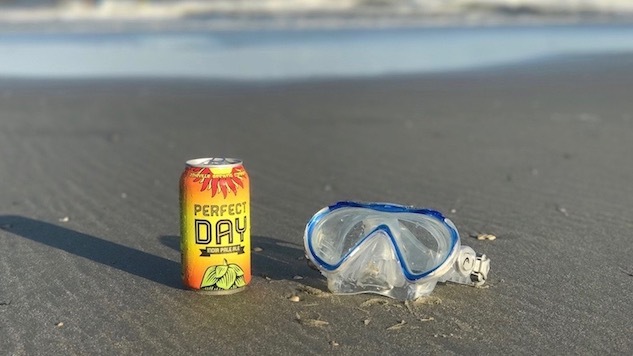 Okay, at 6.5%, Perfect Day is hardly a beach beer, but it’s one of my favorite home town IPAs and has become so engrained in my local adventures, that I simply can’t handle a day of drinking without one or two in the mix. I didn’t even realize this was a Belgian IPA—I just thought it was damned good, and was so blown away by the citrusy hop character, I didn’t slow down to notice the Belgian yeast. If you haven’t had the chance to check out Holy City’s beers, get to it. And start with Paradise, one of the most flavorful session IPAs I’ve found. And it’s just 4.1% ABV. This beer earned my pick for Best Beach Beer of the week. Is New Belgium a southern brewery? No. But they have a brewery in the south, so they squeak by on a technicality. Plus, Day Blazer was built for the beach. Don’t hate. I recently spent a week drinking at the beach. I was doing other things too. Surfing, horse shoes, digging holes and building elaborate sandcastles for children, but mostly I was drinking canned beer, one after the other. You have to be really careful when you’re drinking on the beach for hours on end. Obviously, you want a low-ABV option because you still need to be able to perfectly sculpt sandcastle turrets and execute a bottom turn on the surfboard. The tendency is to go for a really cheap lager—fill a cooler with something mass produced and knock them back like a mall rat hitting the free samples in the food court. But this is a soul-less enterprise that will leave you empty inside. So you need to find a solid craft alternative to the low-ABV, mass produced lager, and then you need to find a completely different craft alternative to that because drinking the same beer over and over, for days on end is also a soulless enterprise. Monogamy is a wonderful thing in relationships. It’s stupid in the beer world. So I scavenged the shelves of the beach’s local beer store looking for a variety of day-drinking-friendly beers. Because I happened to vacationing at a southern beach in a southern city with a vibrant beer scene, I ended up with an excellent southern sixer.